Revered Gurudev Shri Kailash Chandra Shrimaliji was born on 18 January 1958 in an extremely religious and traditional family of non other than Reverent Sadgurudev Dr. Narayan Dutt Shrim...aliji known to ascetics as Paramhans Swami Nikhileshwaranandji and Maa Bhagwati. He was brought up in accordance with the ancient spiritual tradition and culture. Revered Gurudev obtained Law Degree in addition to Post Graduate Degree in Political Science. In his initial years Revered Gurudev served as a teacher in Government School for thirteen years. He was married to Shobha Devi on 7th July 1981. 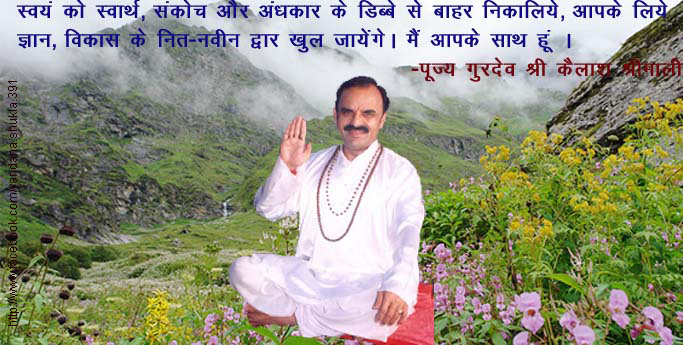 Sadgurudev’s task to realize his mission and aim from the grass root level. He was actively involved in the printing and publishing of the Sadgurudev’s magazine Mantra Tantra Yantra Vigyan by taking care of the press printing and giving dictation to typists about the articles to be published in the magazine. Sadgurudev that he escorded Sadgurudev in almost all the shivirs and spent most of his time with Sadgurudev. Revered Gurudev Shri Kailash Chandra Shrimaliji has been shouldering all the responsibilities of Reverent Sadgurudev Dr. Narayan Dutt Shrimaliji and guiding the people from 3 rd July, 1998 onwards. Each moment of Revered Gurudev’s life has been dedicated to the rejuvenation of the ancient Indian Sciences and Sadhanas. Working day and night, Revered Kailash Gurudev sacrificed his personal moments to help people gain awareness through sadhana shivirs organized across the nation in each and every part of the country as well as outside India. Revered Gurudev is a boundless fountain of knowledge, love and compassion. His radiant eyes are always flowing with blessings. His childlike innocence, the sparkle in his eyes and the irresistible charm, is what captures the hearts of people from all walks of life and they open up their heart to him. Gurudev’s silence speaks more than his words. The mere presence of Gurudev emits vibrations, which quietens the emotional turmoil and stills the ever wandering mind. Revered Gurudev is the personification of dedication, devotion, emancipation and enlightenment. He is very simple, compassionate, loving and caring. He knows your problems before you start talking about it, he is always available to everyone, and he makes everyone feel special. His disarming smile at once makes you feel at ease. Each moment spent with him is a satsang. He has answers to all our spiritual quests. He is the real guru. You sit in His aura and immediately experience an inner peace – no doubts, no fears, and no questions.